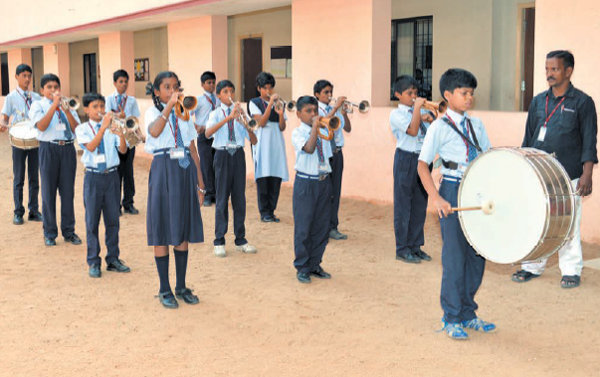 Musically inclined students of class VI can enrol themselves in the SSM Band Troupe. A band is a group that performs musical duties for functions. A typical band consists mostly of wind and percussion instruments. The conductor of a band usually leads the band. SSM school band offers the best service in all school functions. The Scouts and Guides students abide by the Scout and Guide Law. The classes are held once a week on the notified dates and time as per the school calendar. The students are given intense training that many of them become eligible for the Rajya Puraskar and the Rashtrapati Awards. In class VI, the students can enrol in scouts, guides or band troupe. They will continue to be in their respective troupes for the next 5 years till they complete their class X. There is no enrolment in any other class. The scouts, guides and band students are supplied with the uniform in class VII. The students who enrol in Scouts / Guides / Band should not discontinue in the middle for whatever reasons. If a student withdraws, then a fixed withdrawal fee shall be recovered, along with the next term fee.